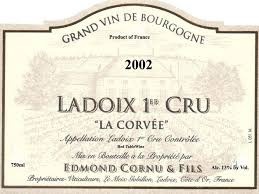 Wine Domaine Edmond Cornu & Fils Ladoix Premier Cru La Corvee 2013 - Royal Wine Merchants - Happy to Offer! The Cornu family settled in the town of Ladoix in 1870 and established the domaine in 1875. Edmond Cornu assumed command of the estate in 1956 and in 1959 began to bottle the fruits of his labor. The “La Corvée” is perhaps our favorite wine from this domaine ; noble, proud, the best that Ladoix can produce ; sturdy, powerful, well-balanced ; a keeper that is not far from the glories of Corton. The vines are located on the northern side of the Ladoix hill with a south-southeast exposure. The vines are old, in excess of 45 years of age (as of 2012). The Cornu family owns a bit more than 1/3 of a hectare. There is a tiny amount of this wine that is imported for the whole country, 35 cases to be precise.